No matter how great or how terrible the past has been for each of us individually, there is one thing that is true about the future for all of us: There are obstacles ahead. For some, these obstacles will be financial. For others, they will be relational and spiritual, and for still others, they will be health related. And if you manage to steer clear of these, then you will be faced with the obligation and responsibilty of caring for and assisting those who are struggling, which brings up the obstacles of apathy, complacency, and selfishness. A real optomistic outlook, huh? But before we throw our hands up in defeat, it is paramount that we put our futures in the proper perspective. Before we surrender to a terrible (or even worse – mediocre) future existance, it is essential that we correctly identify what exactly we’re facing so that we can properly prepare for the battles that lay ahead. That’s right, I said it: Battles. While many people believe and desire for this journey we call “life” to be easy and struggle-free, I understand it differently. Not only have I experienced life to be difficult, but I actually believe it was meant to be full of trials. It was designed to be challenging. It is intended to test us, to push us outside of our comfort zone, and to force us to grow through our failures. Not your idea of a good time? Tough sh*t. This is the way it is, so you might as well get used to it. But rather that just becoming accustomed to and accepting the fact that life is hard and full of obstacles, why not empower yourself to tackle these obstacles head on? Rather than limp into these obstacles with a complacent attitude, why not focus your resources to overcome? As much as we’d like to solve all the problems in our world and achieve instant gratification, I just don’t think that’s very realistic. Poverty, racism, sexism, terrorism, climate change, polution, quality education, etc… These problems are bigger than any one person. They have been around for generations and the chances of us erraticating these problems from our society are slim to none. On the contrary, what we must first do is look at how far we come and how much the generations before us have already accomplished! Sure, racism is alive and well in present day America, but it is also at it’s lowest rate in our country’s history. Do we still have a great deal of work to do? Most definitely. Will racism be 100% abolished within our lifetimes? I doubt it. So should we keep fighting (non-violently) for equality? Without question, YES. Regardless of whether we personally ever get to experience the day when all of the ‘isms cease to exist is irrelevant to whether or not we should incessantly do the right thing. For generations our ancestors toiled through hardships we couldn’t even begin to imagine having to deal with, in order to build a life of equality and prosperity for themselves and their children. Most of them never had the chance to experience the fruits of their labors, but they fought anyway. Not because they were misguided about how long it was going to take to reach their desired life, or because they were so confident that their children would carry on their legacy… They fought the good fight because they could! They had the strength and the will and the courage and the audacity to keep fighting, so they did. And though they may not have accomplished everything they had desired, they did accomplish the most important thing: They made it possible for us to live and fight another day. If you woke up this morning with breath in your lungs, you are both equipped and obligated to continue fighting the good fight. “But the fight is hard”, you say. Yes, but not TOO hard. “But the destination is far”, you say. Yes, but not TOO far. “But the obstacles are large”, you say. Yes, but not TOO large. “But the opposition is strong”, you say. Yes, but not TOO strong. “But I am weak”, you say. Yes, but not TOO weak. At the end of the day, what other options do you really have? You can either “fight the good fight” or simply accept things the way they are. And though that may seem like a feasible solution (easy way out), it only works if everyone else is equally resigned to the current state of affairs. For if they are not ok with the easy way out and they continue to fight, then you will still be left with the obstacles of apathy, complacency, and selfishness. Colagero: Sonny was right. The working man is a sucker, Dad. He is a sucker. Lorenzo: He’s wrong, it don’t take much strength to pull a trigger, but try get up every morning day after day and work for a living. Let’s see him try that. Then we’ll see who’s the real tough guy. 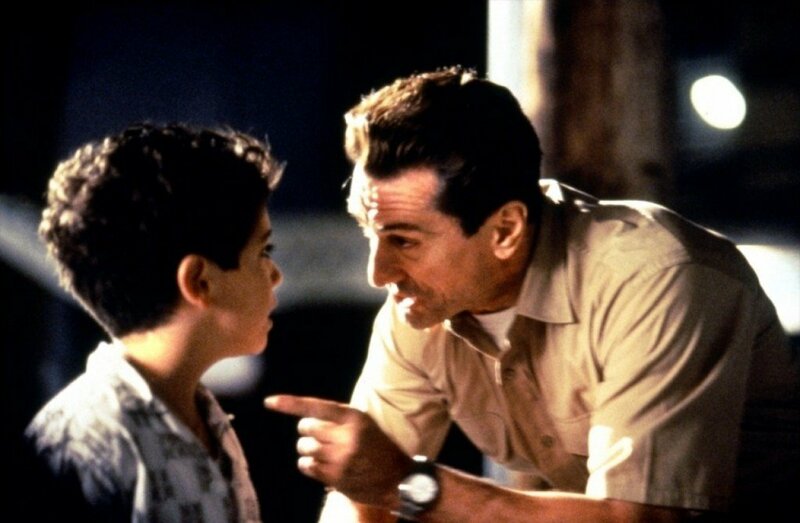 The working man is the tough guy, you’re father is the tough guy. So as you wake each day and move towards the obstacles in your life, don’t be discouraged by the grind. You’re not going to lose 25lbs in a day or finish your degree in a week or heal your broken heart in a month. Fighting the good fight requires persistency, perseverence, passion and dedication. It requires fighting on, one pound at a time and one class assignment at a time. It requires not giving up when you gain back 3lbs or fail a class. It requires being tough, even when you don’t feel like it. The working man is NOT a sucker. The working man is the tough guy. Here’s to fighting the good fight in the New Year.